Learn EXACTLY what you need to know about the family entertainment center industry, what it takes to get started, startup costs, activity mix and what kind of a return on your investment you can expect. If you are looking for an unbiased review of the process to start, operate and manage a family entertainment center business, this 33 page ebook is what you have been looking for. You are looking for information to start a family entertainment center business, and for most new amusement business entrepreneurs, that means what the business will cost to get started, and how much money you could potentially make, right? How profitable is the family entertainment center industry? What will it cost to open an indoor family entertainment center? What kind of return on my investment can I expect? How long before I pay back my investors? What are my demographics, where do I find them, and what do I do with them? Should I lease a space or purchase my own building? What activities should I include and where can I find those suppliers? What are my fun center equipment costs? Insider secrets some sales reps will keep from you. What Federal Grants, Free money and other financial resources are available? 4 things your potential funder wants to hear. Why family entertainment centers fail - how to protect your investment. ""This single report saved me hours of time researching and money spent on wasted phone calls. I now have the information needed to make a decision about moving forward or letting go..."" -George K., IN. Before you can find out if this business makes sense for you or if you qualify for funding, you need a completed fun center business plan. It takes a lot of time and energy to complete a business plan, gathering information, catalogs and prices and compiling that information in a well thought-out, well researched professional format. Many companies don't want to give you specific prices and costs until you decide if you are going to move forward, or have a site / location with floor plans. But how can you move forward if you don't know how much it's going to cost? This comprehensive, straight forward fun center industry report was put together to give you an honest look at what it takes to build, open and operate a family entertainment center. From funding options and equipment costs to staffing and management challenges and most importantly, will you make money at it? How much and when? No Bull, no sugar-coated maybe's or possible's, just what it takes and what you can expect. What kind of profits can I earn in this business? This FEC Business report comes complete with an Fun Center Revenue Calculator. The Revenue Calculator is provided as an estimate of potential revenues based on current amusement industry operations (included as a Microsoft Excel Spreadsheet). It comes complete with real-time industry data including attendance projections, per capita spending, high and low operating expenses, typical marketing budgets and owners salaries. Use the Revenue Calculator to easily run a variety of ""what-if"" business scenarios. 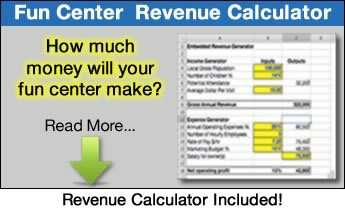 ""The embedded revenue calculator alone is worth the $30 dollars. I was able to determine just how profitable my idea could be."" - Dawn L., CA. What is my gross revenue potential? What if I charged more or less for admission? How would that affect my revenues? What if I reduce my annual operating expenses by 5%, how would that affect my income? What if you increase staff salaries by 3%, how would that affect profitability? What if I extend my market area to the next community, how would their additional demographics affect my costs and revenues? This is a great first-look tool for those who are just starting to think about the idea and are curious to know if the business really makes sense for them. Better understand the market potential before you waste time and money. Don't waste your time trying to figure out if this makes sense or not by talking to a bunch of commissioned sales staff, it's their job to sell you stuff. How objective are they going to be? Learn what you need to know to start a family etnertainment center business here. Sure this is a great idea for you and your community. There is nothing like it in your area, or the existing choices for family fun are poorly operated and you feel you could do a better job and make a good living. But how do you know if this is going to work in your area? What type of fun center project and project scope is the right one for the area? Do you have a large enough community to support your amusement business? How many people will come to your family fun center? How often will they come? Should you provide food service? What are the average per cap spending habits of your guests? How will different activities and attractions affect those spending habits? Does your facility design affect spending? You bet it does...! Get these questions answered and more! Today, right now make the decision to learn about the business and get your family entertainment center project started. Learn what information you need, where to find it and from who to make this dream a reality - don't delay! "I had no idea where to start or what to do. This report gave me an industry snap-shot and more importantly, what to do next. Money well spent." - Barb S., TX.